There are so many old sayings regarding hard work that if we went through them all you would probably fall asleep before you reached the end. One is “many hands make light work” and another is “I find that the harder I work I more luck I seem to have”. A profound quotation from Thomas Jefferson, the third President of the United States and one of the country's founding fathers. What do you think he meant by that quote? To us, it reads as if you are making your own luck by working hard to achieve your dreams rather than just hoping they are going to land in your lap. This philosophy is as important today as it was way back in the 1800's when Jefferson made this bold statement. 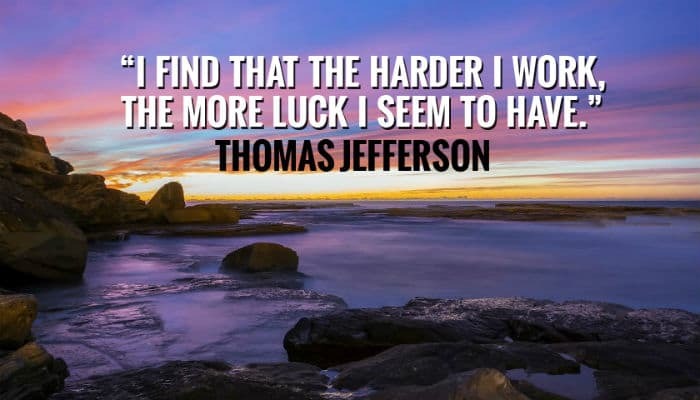 It is particularly important in the work place where everyone has to pull together and do the same amount of work to achieve success, or luck as Thomas Jefferson called it. The tranquil scene in the corporate ecards which act as the backdrop for this legend seems symbolic of the fact life is good when everyone pulls together and you can relax in the knowledge you all have each other’s backs. Maybe your team needs to hear this and there is nothing to stop you being the one to tell them. How does your business communicate well wishes to clients at Christmas time? If you send greeting cards then you need to give our Christmas ecards for business 5 minutes of your time.